When her parents divorce, a sixth grader struggles to understand that sometimes people are unable to live together. I loved Judy Blume growing up, and when I saw It's Not the End of the World on my library's e-book list, I thought, "why not?" and decided to read it. I did not realize that this book is more of a middle-grade novel, but it was still good enough for me to finish it. Karen is 12, and a middle child. Her older brother Jeff is her mother's favorite child, and her younger sister Amy is her father's favorite. Karen quickly learns that in matters of divorce, it's better to be no one's favorite. Karen cycles through wanting her parents to get back together, and trying to get them back together, to finally understanding that it's better for them to live apart. It's Not the End of the World was a sweetly written story about divorce and how it affects everyone in a family. I think it would be a great book for parents who are divorcing to read with their children. I enjoyed the book, even though it was too young for me and not my usual style. It was a very short read: I finished it in less than an hour. 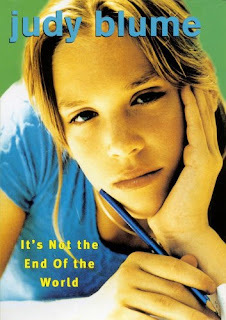 Judy Blume is one of those authors that doesn't write duds, and It's Not the End of the World is no exception. JB is definitely something I'm looking forward to exploring through and with my daughter when she's older. I bet she's fun on audio too. Thanks, Kelli, for the post. JB was also one of my favorites as a kid. Could I ask a huge favor? I'm trying to get my blog up and running and would love it so much if you could follow! I'm an a aspiring author, I grew up with Natalie in the great big town of Vidor, and I would appreciate all the publicity I could get. My first novella, a YA story set in a world of female super heroes, comes out as an e-book in February. Anyway, my blog address is TamaraDaresToWrite.blogspot.com.